The recent news that Elon Musk works a 120 hour week is rather alarming. And it seems he is not alone in this alarming trend according to the Guardian. However, numerous studies show that this level of work is usually counterproductive – both in terms of quality of work and decisions made and the long term impact on health. Just search ‘health consequences of overworking’ to see what I mean. Mr Musk says he is down at the car factory all hours, struggling to ramp up production of the Tesla 3 model. I have a lot of admiration for the Tesla range of cars*, the clever technology developed and the way in which they may make a significant impact on our reliance on fossil fuels. Nevertheless, having developed such an innovative vehicle, I would have thought that putting it into mass production would be the (relatively) easy part – build the production process into the development work, hire some talented production engineers and factory managers and you are most of the way there. I don’t suppose Mr Musk is donning his overalls and putting in a shift on the production line, but I do wonder if he is delegating enough and delegating to the right people. It used to be said that if you could not do your work in a normal 40 hour week, you were either overloaded or not up to the job. If you are overloaded, you need to delegate more. All this ties in with a successful work-life balance – often the most talented people need a shot of common sense to realise that success is as much about working smart as working hard. This includes delegating a lot of tasks to your talented team. Who could do this for you? Pausing to ask yourself why you are doing (or not doing) a particular task can be surprisingly productive. It also helps to have a good sense of humour. 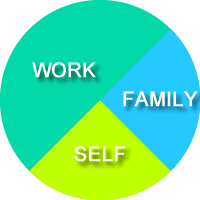 I once came home from work with a neat little diagram showing how the time allocated between work, family and self needs to be managed.